It's a Model I with three rotors. Location map and visiting info. Peter S has a nice Flickr album with great close-ups of the exhibit. The artifact sheet is from the "Canadian Museum of History" site rather than the "Canadian War Museum." It appears that the unit is cataloged in the former museum's collection, but I am told it is on display in the latter. - A local unit I somehow missed seeing when visiting this museum. Will remedy soon. - Thanks to museum staff for an info update. Picture and a nice view of their display area. Any additional info about the unit(s) on display would be appreciated. - Had the enjoyment of visiting this one in 2015. Great exhibits. See a picture and article about how missing parts were recently recovered. Their enigma machine overview page. Three or four rotor unit? Don't know. If you're nearby, visit (location info) and let me know what you see! Good spot to visit when visiting Paris. Info and directions. - Had the enjoyment of visiting this one in 2012. Appears to be part of Museum w locations also in Frankfurt, Bonn and Nürnberg. I think that this picture is that one. For images see this link and scroll down. They indicate they have a rare 10 Rotor T52 unit of which only 5 exist. 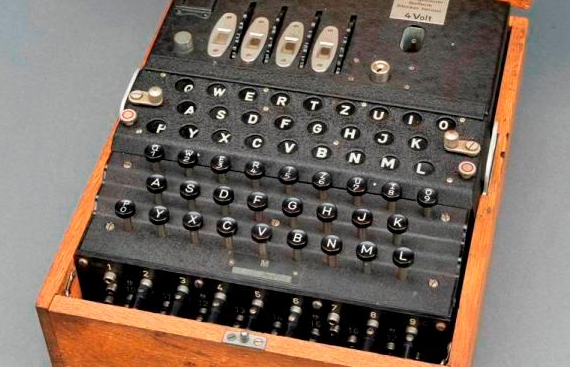 Not an 'Engima' branded unit, but an interesting piece of cryptographic history. Location - It is a private museum, to which public visits are possible at scheduled times. Article about the unit's recovery with a picture of its crusty mangled state. A shot or two of their display from an area teacher's blog. A four rotor unit that divers illegally lifted from the sunken U-85, but was later granted on loan to this museum by the German government. Photo of units from a visitor's Flickr page. Appears to be two four-rotor units that were recovered from the sub. They inexplicably had a 'no-photos' rule on my last visit, though I flouted it on principle. Of course Flickr has pictures of everything - so click here or here for another angle of the same unit. This is a three rotor unit that resides in the war rooms complex. The serial number wasn't visible. - Visited in central London on a visit around 2009. Updates welcomed. A picture of their (?) unit. It's a three rotor unit, in their "Secret War" exhibit. Thanks to Mark for some updated info. Thanks to Mark for the info. Possibly a polish replica unit? Not strictly the sort of unit I'd note on this list, but given the Pole's pivotal role in cracking the system during WWII, it sounds like an interesting connection. Some information about location & visiting. More info welcomed if you pop in! Military Intelligence Museum at Chicksands Bedfordshire, UK. Another suggestion from an email, indicates the Signals museum. It seems to be affiliated with the Chicksands Museum as well, but I need to do a bit more reading. Not sure if they share the same unit or if there are separate exhibits. These are both parts of the British Army museums. Very rough, slow web page, but here's a view of their exhibits. How to get there, to this museum at a working military camp. Sounds like a small but interesting museum, in an out-of-the-way place. A collection built up gradually over the years, starting from a kid picking up old bits and pieces. Here's a nice page on their four-rotor unit. Again, thanks to a note from Mark pointing this one out. This is a bit different. You'll have to chase this one around the UK. They travel about to re-enact historic events of the WWII period. Check their site for a spot near you if you live in Britain, or will be visiting. An up-close and personal opportunity! The Society's web site is located here - Check their events button for upcoming dates. Thanks for the note from Les who is with the group! Check out a picture and background on their unit. See a picture of their unit at the top of their collection page. -Thanks to Dirk for his comment and info. ...let me know if you know of other Enigma machines not in my list yet. Also, if you have seen one of these displays, do let me know either through a comment or an email. It's nice to confirm that each is actually at each of these sites, some of which are less prominent than others.